Srinagar, March 23: Former Jammu & Kashmir chief minister and president of the People's Democratic Party (PDP), Mehbooba Mufti, will be contesting in the upcoming Lok Sabha elections 2019. 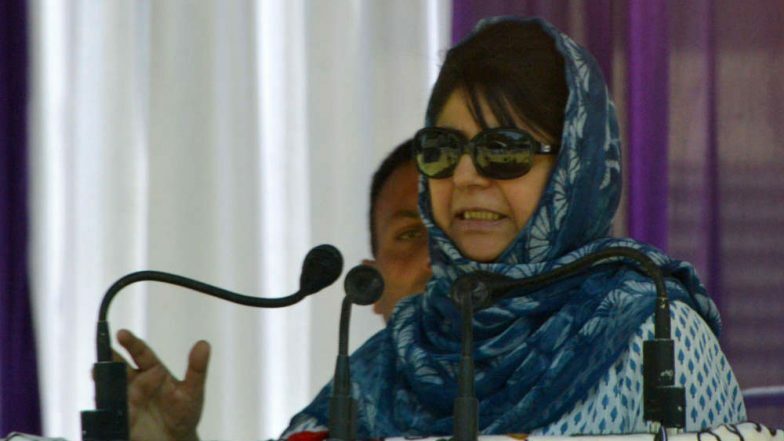 In a statement issued on Saturday, Mufti said she would be re-contesting from the parliamentary constituency of Anantnag. In the 2014 general elections, Mufti had successfully wrested the seat, winning over 2.3 lakh votes. The electoral share which she drew was nearly 53.1 per cent. The constituency, however, was vacated in 2016, when she took over as the chief minister following the death of her predecessor and father Mufti Mohammad Sayeed. Congress, National Conference Seal Alliance in Jammu And Kashmir. Since 2016, no bypoll could be conducted in Anantnag due to the lack of a conducive atmosphere for elections. Following the death of militant Burhan Wani in July that year, the Valley, particularly South Kashmir, has remained a volatile region. For the first-time in Indian electoral history, an election to one parliamentary constituency, Anantnag, is being held in multiple phases. Due to the high-security arrangements necessitated, the seat would go to polls in the third, fourth and fifth phases, scheduled on April 23, April 29 and May 6, respectively. PDP insiders say the party is facing its toughest electoral contest since its inception, considering a wave of anger against the recent state government headed by Mufti. This is also the first major polls the party is contesting in the absence of its founder and patriarch Mohammed Sayeed. "Mehbooba's decision to ally with the BJP has hurt most people in the Valley. The anger against the Centre will also be directed against her, who was their ally for 4 years," said Anantnag resident Saleem Shah. Meanwhile, the National Conference and the Congress - though in alliance - would compete in a "friendly battle" in Anantnag. The BJP has announced Sofi Yousuf as their candidate from the seat.